For 17 years we lived next door to whales, porpoises, seals, water-ski extravaganzas, jungle playgrounds and excursion canals to exotic lands. It was a place where a lucky few would pet a cheetah or be kissed by a dolphin! It was Marine World and it changed Redwood City. Marine World filled the land now occupied by Oracle’s shiny blue campus. It’s the reason we have a Marine Parkway and a Twin Dolphin Drive in a neighborhood without a marina - or twin dolphins. 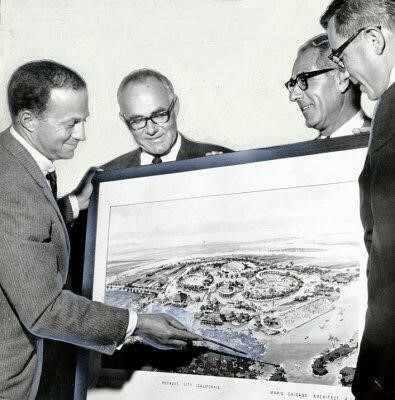 Visionary, businessman, and first general manager Bradford S. Baruh, hoped it would “…be everything to marine life that Disneyland is to the world of fantasy.” But where would he find the perfect location with water access, ease of transportation, and – “climate best”? The first Redwood City site considered was the “Archibald Property” near Pete’s Harbor. A $100 per day lease held the property while the search was on for investors. However, it became clear that a larger site was needed. For the future Marine World, the 66-acre Leslie Salt property on Belmont Slough, just north of the planned Redwood Shores community, had everything. For Redwood City, the park would bring an anticipated one million visitors a year, exciting careers and summer jobs for local residents, and, hopefully, would attract buyers to the new community. City Council at 3 a.m.
A partnership with the American Broadcasting Corporation brought financial backing and a new company, ABC Marine World, was formed. Attention then turned to obtaining City Council approval. Baruh and ABC executives made numerous community and council presentations with maps and models and, on August 3, 1966, Redwood City Council gave its approval - at 3 a.m. A celebratory press conference held later that day at the Elks Club was televised, of course, on ABC television. Marine World’s first animals were purchased from a closing animal park in St. Petersburg, Florida.Two pilot whales, four dolphins, and seven Humboldt penguins were flown to SFO in custom tanks, crates, and slings on Flying Tigers Airlines. Sonny Allen was recruited as head animal trainer. Allen took advantage of the natural behaviors of each species and trained the animals to perform in response to commands given by whistle, hand gesture, splash, or music. Jim Rusing took charge of the boat shows, and Margie Rusing, Jim’s wife, trained the Aqua Belles champion women water skiers. It was Jim Rusing who taught a 600-pound baby to water ski. Judy, a young Asiatic elephant, and apparently an avid skier, was destined to become the star of the show. Judy fell off her ski (two pontoons connected together) only once. The water closed over her head and the audience gasped. Immediately, the tip of Judy’s trunk poked above the surface and moved towards the shore. Judy walked out of the water, got back on her ski, and continued her performance - as any pro would. A “huge” park favorite, Judy was often invited to dry-land events as well. In fact, it was Judy at the photo-op wielding a shovel at the ground-breaking ceremony for the first homes in Redwood Shores. In 1972, Marine World was sold to Resorts International, which already owned Africa USA, a southern California animal training facility that provided “talent” to the entertainment industry. A merger of the two brought tigers, lions, zebras and gazelles to Redwood City. Marine World/Africa USA added lion and tiger shows, and wild animals walking the park on leash to the entertainment mix. An Ecology Theater was both educational and brought the audience close to wild birds, mammals and reptiles. Kids could take a ride on an elephant or camel. The new park offered an eclectic mix of special events. There were operas, ice follies and even a Canadian lumberjack competition. Skateboarders and low-riders had their days, too. “Saturday Night Summer” kept the park open until midnight. Major rock groups took the stage while the whales and giraffes tried to sleep. Bands included Big Brother and the Holding Company, Commander Cody and his Lost Planet Airmen, Tower of Power, Dr. Hook and the Medicine Show, and Joy of Cooking. Milk carton boat races became a major event for a number of years. Schools, clubs and scout troops built their own boats entirely out of waxed milk cartons then competed in a race across the lagoon. Some boats even made it all the way across. By the early 80s, developers Campeau Corporation had plans for a $300 million office and hotel project on the site and a search for a new home ensued. Timing was very important. If a new park could not be built before the razing of the Redwood City location, the animals would have to go to temporary facilities and park employees would lose their jobs. Campeau decided the park could stay another year. Vallejo jumped in with a winning offer. And Redwood City’s Marine World/Africa USA saw ticket sales soar. Closing day in Redwood City was Sept. 29, 1985. Over 350 exotic mammals and innumerable fish and birds were moved in nets, crates, cranes, slings and caravans of trucks. Twenty-two animals, including camels, goats, llamas, burros and peacocks traveled by ark – a steel barge that carried them across San Francisco Bay. On June 16, 1986, two elephants held a grapevine aloft in Vallejo for the official vine-cutting ceremony. And the story of Marine World continued.